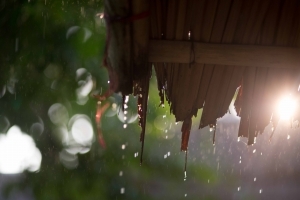 The rainy season in Thailand varies from region to region and lasts from May to October. 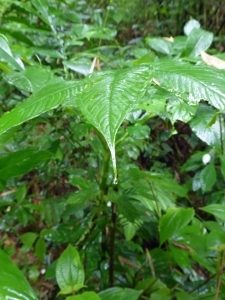 So we are only at the beginning now, but the short, sharp very heavy downpours do limit the construction and infrastructure work that we can do on our jungle site at Ban Ton Sae. The intensity of the rain is notching up day-by-day as we head into the full swing of Southern Thailand’s monsoon months. Dark clouds appear with a strong warm wind, then a few heavy drops of rain warn you that you have only a few minutes to find cover before the skies open and rain belts down. You may be trapped in your shelter for 20-30 minutes but then the rain stops as suddenly as it started, the clouds disappear and the sun comes out. But the sheer volume of water that falls means that the tracks get muddy and waterlogged. Building works require dry conditions for laying foundations and work on the future education and visitor centres, as well as the elephant hospital will have to wait until later in the year. The sheer magnitude of the rain can sometimes cause a minor flash flood on the site and we must always be mindful of this although the extensive site drainage that we installed earlier in the year should mitigate the risk. Flooding would threaten our newly planted grasses and could also affect the wonderful forest trees we have planted with your generous help, so Jake is keeping a very close eye on things. climate. 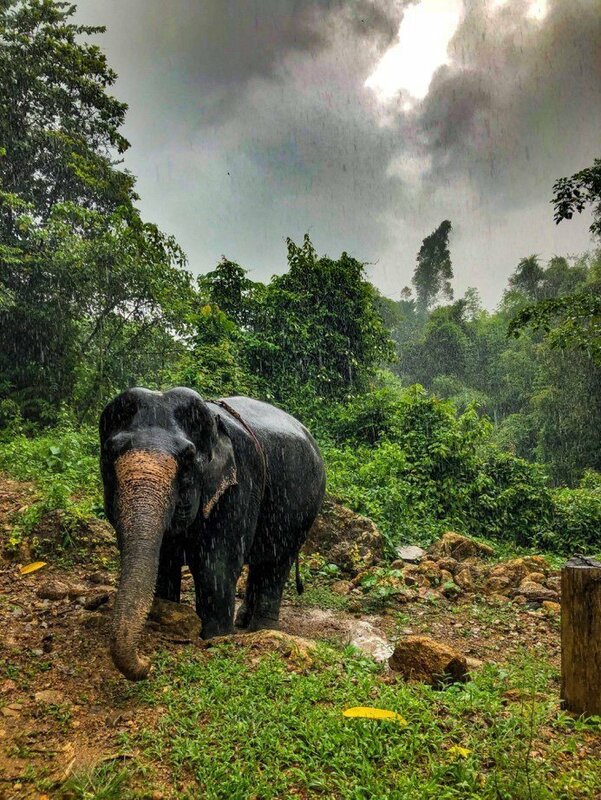 As shown in the photos, elephants aren’t fazed at all by the monsoon rain, and embrace it with all its force. 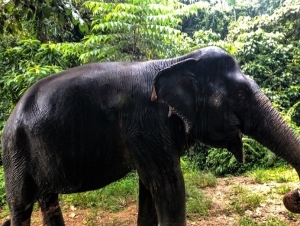 We can’t wait for STEF’s future elephants to be resting in the Park, enjoying the monsoon season. 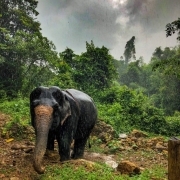 However, there is silver lining behind all this rain as it has given us the opportunity to re-focus our attention on sharing STEF’s message of the need to help conserve the Asian elephant, and our STEF fundraising program. 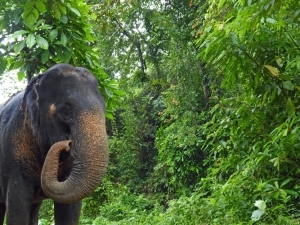 If you can help us, please sponsor one of trees at the Ban Ton Sae site to help us get the ecologically sensitive park that we need for the elephants. Just click here to sponsor a tree now!